The new Climax movie trailer has arrived. Just don’t drink the sangria. One of the best films to play at this year’s Cannes film festival back in May was Gaspar Noé’s latest, one which played on a cold-ish Sunday morning on the Croisette. By the time the credits rolled, we had all been warmed by the 90 minutes of pure debauchery we’d witnessed – a pleasure-filled, blood-pumping horror musical that all should see. A24 and Vice Studios have picked up the film for U.S. distribution, and it will roll out over there later this year. UK audiences will actually get the film sooner – it will roll out at Britain’s premiere horror festival FrightFest later this month, and into wide-spread UK cinemas from 21st September. 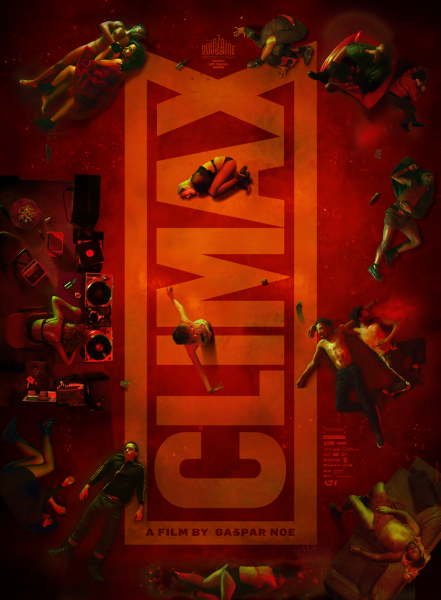 Climax is as close to a zombie-fied horror as Gaspar Noé will ever make – a trippy, mind-bending kind of ‘whodunnit’, one that gives a truly unique, very memorable cinema experience. It is sure to shock, repulse, and be a major talking point – just like all of this filmmaker’s other films, really. If those were up your street, then this won’t disappoint. If they offended you, then don’t be surprised to feel the same about the new one. Either way, you can’t argue that he’s more than delivered with this offering – an acid-fuelled, relentless shocker that’ll stay lodged in your brain days after experiencing it. Quite a trip indeed. Here’s the official synopsis for Climax. From director Gaspar Noé (Irreversible; Enter the Void; Love) comes a hypnotic, hallucinatory, and ultimately hair-raising depiction of a party that descends into delirium over the course of one wintry night. In Climax, a troupe of young dancers gathers in a remote and empty school building to rehearse. Following an unforgettable opening performance lit by virtuoso cinematographer Benoît Debie (Spring Breakers;Enter the Void) and shot by Noé himself, the troupe begins an all-night celebration that turns nightmarish as the dancers discover they’ve been pounding cups of sangria laced with potent LSD. Tracking their journey from jubilation to chaos and full-fledged anarchy, Noé observes crushes, rivalries, and violence amid a collective psychedelic meltdown. Starring Sofia Boutella (Atomic Blonde) and a cast of professional dancers, Climax is Noé’s most brazen and visionary statement yet. Check out the new Climax movie trailer below.